Cosmelan is a 2-step intensive topical treatment system designed to reduce and regulate stubborn and dense pigmentation and blotchiness. Cosmelan's blend of synergistic ingredients work fairly quickly, resulting in an effective blending and reduction of undesirable pigment. Cosmelan regulates the melanin activity, causing the pigment producing cells to slow down their abnormal over-production and function in a more uniform way. Cosmelan is "sun-friendly" so you can use the products and still have an active outdoor lifestyle. It works well on all skin types – even darker toned Asian, Mediterranean and Latin skin. Cosmelan will also produce a slight initial peel which helps refinish the skin surface while diminishing hyper-pigmentation. Melanin, the natural pigment that determines skin, eye and hair color, is usually evenly distributed. But when factors such as sun exposure, heat, hormones or skin injury disturb the melanin cells, the color distribution becomes haphazard, resulting in mismatched skin, brown patches and spots. The ingredients of Cosmelan lighten existing pigmentation and regulate future melanin production. The First Step in your Cosmelan program is the application of a pigment reduction activating mask called Cosmelan I. This is a key component in stimulating the quick response. The special Cosmelan Mask is left on your skin for 5 to 10 hours depending on your skin type and sensitivity level. Your At-Home program will consist of active-ingredient products that you will use on a consistent basis to further improve pigmentation problems and prevent excess pigment formation. Your maintenance cream, Cosmelan II, will be used on a ongoing basis. This special pigment control cream contains ingredients such as Kojic Acid, Phytic Acid, Ascorbic Acid and a protective agent, Titanium Dioxide. *Cosmelan is formulated without Hydroquinone. Active ingredients include azelaic acid, kojic acid, arbutine, phytic acid, ascorbic acid. Cosmelan® Depigmentation treatment action mechanism is based on the inhibition of tyrosinase, a basic enzyme in the melanin formation process. Several of the substances present in the Cosmelan formula act by blocking this enzyme. Hyper-pigmentation is very difficult to conceal, even with heavy makeup or camouflage creams. Women who have previously had to resort to unnatural looking cover up makeup and concealers are generally able to use only a minimal amount of makeup once they have adopted the Cosmelan program. 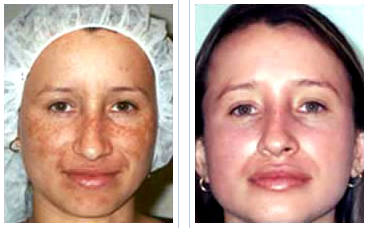 Melasma or Chloasma: Skin coloration that appears as blotchy brown spots, often covering cheeks, forehead, or temples. This type of hyper-pigmentation can be hereditary, or triggered by hormonal changes such as pregnancy or menopause. Taking birth control pills can also trigger Melasma. In addition, some treatments may worsen the condition so be sure to consult a physician prior to having treatments meant to improve melasma. Age Spots or "Liver" Spots: Smaller darkened patches usually on older adults who have been exposed to the sun for many years. These spots can be seen on the face, forearms and backs of hands. Acne – particularly cysts or nodules – often leaves brownish discoloration after a blemish heals. Persistent cystic acne can be minimized with Photodynamic Therapy. Incorrect chemical peels, improperly performed laser hair removal, or poorly chosen laser treatment can cause hyper-pigmentation. Rashes like psoriasis and eczema often darken the skin as well. Even leg waxing and electrolysis can cause the melanin cells to over-react. Prolonged exposure to heat, whether from being in the sun or working over heat-producing appliances can also be a potential cause. 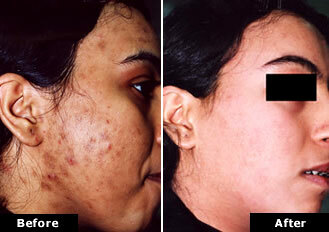 You must not use glycolic products for at least one week prior to your first Cosmelan treatment. You must not combine other topical treatments with Cosmelan. Dr. Sedgh will provide guidelines for home use products so they will work correctly with your Cosmelan products. From time to time, additional measures are incorporated to further the results. Poor skin texture combined with pigmentation may respond best to fractional resurfacing, as will Melasma and Chloasma. Chemical peels may be used as an adjunctive in reducing sun damage-related pigmentation. IPL for pigmentation that is not hormonally induced, is good also for diffuse pigmentation from sun damage. PhotoDynamic Rejuvenation is a process for targeting damaged skin cells with a topical light activated solution. During your complimentary consultation, Dr. Sedgh will explore all options for reducing skin blemishes. Call Beverly Hills Laser Institute, Inc. at 888-333-2515 today. Disclaimer: The information throughout this medical spa and dermatology website is not intended to be taken as medical advice. The information provided by Beverly Hills Laser Institute, Inc. - Dr John Sedgh is intended to provide general infomation regarding BOTOX, Juvederm, Restylane, Kybella, laser hair removal, acne treatment, chemical peels, medical weight loss, bioidentical hormone therapy, stretch mark treatment, photofacials and more for residents of Beverly Hills, Cerritos, Lancaster, Santa Ana and nearby areas of Los Angeles County, California. This website is not intended for viewing or usage by European Union citizens. If you are interested in finding out more, please contact our medical aesthetics office today for a personal consultation. Read our ADA compliance disclosure. Copyright © Beverly Hills Laser Institute, Inc.